Rooted in the county's history, culture, & local bounty. Our mission is to improve community access to healthy, local food and promote economic development rooted in the county’s history, culture, and local bounty. We will improve the livelihood of local food producers and entrepreneurs, and encourage development of new food-related businesses and jobs. The Canal Market District isn’t just about finding fresh, local produce. It’s about building relationships with the people that make up this community. As our city prepares to restore the South side, we want to solidify our commitment to revitalization by providing a space that encourages everyone to learn and grow together. Several urban renewal projects in the downtown area are contributing to a pivotal time in our history. With the help of local leaders, fellow citizens and the city of Newark, we have been working to improve the quality of life in our community. Bringing healthy, affordable, and locally produced food to our community is central to this revitalization and the economic development of Newark and Licking County as a whole. We are picking up where the Ohio Canal left off. The Canal Market District has reclaimed this space in the same spirit of our ancestors: bringing people together to share local food and crafts. 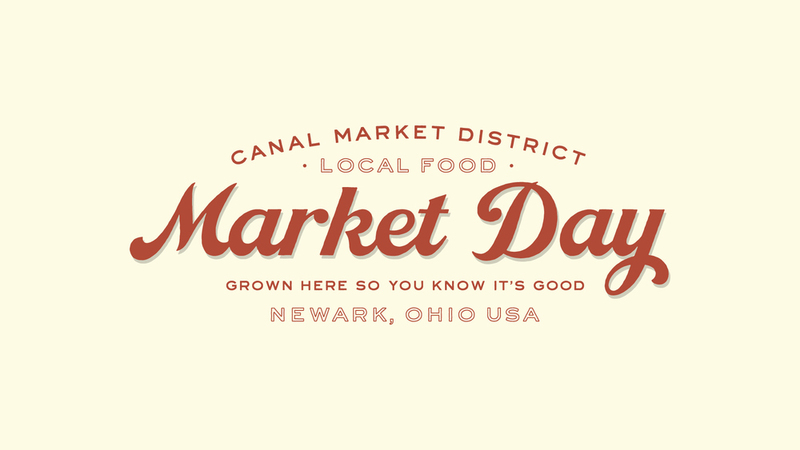 The Canal Market is proud to add our value to the culture of Newark. Do you qualify as a CMD Farmer’s Market Vendor? Read the 2019 Vendor Guidelines to find out! Applications are now being accepted for the 2019 Canal Market District Art & Craft Market. Please note that the CMD Art & Craft Market requires that vendors both be located in Ohio and all products must be assembled by the applicant - no kits, commercial molds, or buy/sell merchandise will be accepted. This is a makers market, not a flea market or reselling boutique. Saturday, May 11th - Mother’s Day Market, 10am-3pm (held in conjunction with the Newark Food Truck Festival) ALL VENDOR SPOTS SOLD OUT! NOT A VENDOR YET BUT WANT TO BE? get ON OUR ART & CRAFT EMAIL LIST! **APRIL 16 2019: We are still updating our site with new vendors - keep checking back! * This vendor sells products from multiple categories. We feature local musicians each week at our farmers market and once a month at our Second Saturday craft markets. If you are interested in performing at the Canal Market District, please contact CMD Director Michelle Newman at director@canalmarketdistrict.org. Here are just a few of the dozens of musicians who volunteer their time and art at the Canal Market District. Brad Fuller is a singer and guitarist who specializes in classic tunes from the 60s, 70s and 80s. He is a seasoned cover artist and combines classic rock, blues, pop and country all into one engaging set list. Mary Miller's relaxed Folk, Country and Gospel tunes highlight her sweet voice. Her joyful presence puts folks at ease and encourages them to two step & sing along to familiar tunes. Mary is also a comedian, inspirational speaker and founder of the charity, "Fill Your Cups". Singer-songwriter John Begala plays a unique combination of originals and covers spanning folk-rock, blues, bluegrass and jazz. Rocky Fork and lil Maggie will transfer you back to Civil War era times – tunes played originally on the fiddle are adapted to clawhammer banjo picking style featuring mountain clogging, flatfooting, and buckdancing as accompaniment. Natives of Licking County, Rocky Fork and lil Maggie have always had a passion for music and simpler times. They’re active members of the community, and can most often be found performing at the Canal Market District Farmer’s Market in Downtown, Newark! Greg Greyson: A lifetime of playing guitar and crafting original music. Soft rock with a little country, a touch of jazz, and a whole lotta living. You can catch Greyson on Facebook here. Crystal City Chorus sings barbershop music, is part of Sweet Adeline’s International, and loves being part of Newark. Simple Man Music is Randy Williams. The name derives from the Lynyrd Skynyrd song, Simple Man. Not only do I like the song musically, but the lyrics speak to what I am and how I perform. I have my guitar and my voice. I play the guitar and I sing. My song list runs the gamut from Classic Rock, to Americana, to New Grass, and more. Always the songs are simple, straightforward expressions. One of the advantages of being older is that I have been around to hear over 50 years of great music. If you are present when I perform, you are sure to hear a song from your era. If Ernest Tubb Could Sing - Unplugged Americana Music. IETCS is a three-member group inspired by the many streams of America’s rich musical traditions. Their repertoire spans classic country, rockabilly, early pop standards, contemporary singer-songwriter ballads, and Appalachian old-time stringband music. With musical roots in Ohio and Texas, the members have performed on college campuses and other venues throughout Ohio and beyond. Howard Sacks and David Suggs play guitar, Judy Sacks is on mandolin, and everybody sings. The group’s name is a fond tribute to Ernest Tubb, country superstar of the mid-twentieth century. Rob and Eddie are a musical duo that were brought together through the attraction of dance. Rob has been a techno and house club DJ for 20 years. Eddie has been a Square Dance caller and MC since he was 10 years old. Looking at a fundamental opposition to their musical backgrounds you may wonder how does this group function? The basic rhythm of the 4/4 beats brings the two musical worlds together. So, come, experience a truly unique musical and dance experience that you will enjoy, and let's re-imagine what the world can be! listening set of music entertainment. Wes Williams: "Over the years I have sought to select ‘good songs’ for my repertoire. So, what do I consider a ‘good song’? A memorable melody, solid lyrics, emotional content, groove and heart. I listen for songs which are meant to build community, provide comfort, express positivity and always for songs of peace and love. These songs carry what I refer to as hippie DNA! The genre is irrelevant." Our Senior Farmers' Market Nutrition Program is organized through LifeCare Alliance. These programs assist older adults (age 60+) or medically challenged residents through Meals-on-Wheels, the Columbus Cancer Clinic, Project OpenHand-Columbus, Visiting Nurses, Senior Dining Centers, Senior Wellness Centers, Help-at-Home, Groceries-to-Go Pantry, IMPACT Safety and Senior PetCare. The overarching goal of the agency is to assist clients in remaining independent and in the comfort of their own homes or the community with dignity, where they want to be. WIC is the Special Supplemental Nutrition Program for Women, Infants, and Children. WIC helps income eligible pregnant and breastfeeding women, women who recently had a baby, infants, and children up to five years of age who are at health risk due to inadequate nutrition. The WIC Farmers' Market Nutrition Program (FMNP) is a dual purpose program which benefits both WIC participants and farmers. In the program, WIC participants are given five $3 coupons with which to purchase authorized fresh fruits, vegetables and herbs from authorized farmers at farmers’ markets and farm stands. SNAP offers nutrition assistance to millions of eligible, low-income individuals and families and provides economic benefits to communities. SNAP is the largest program in the domestic hunger safety net. Canal Market District’s farmers markets accept SNAP benefits for all eligible foods. In addition, SNAP users have the opportunity to double their buying power through our partnership with the Produce Perks network. For SNAP families, up to $20 per market will be matched with an extra $20 to spend on fresh fruits and vegetables. When are you available, generally? The Canal Market District is seeking a Market Assistant to provide outreach to SNAP/EBT customers and manage the Produce Perks and SNAP/EBT transactions at the Market Manager table through the 2019 Market Season. The market runs every Friday from May-October, and every Tuesday from June-September. Market hours are from 4-7pm, and the Market Assistant would likely work the 1-2 hours before and 1 hour after the market to assist the Market Manager with set up and tear down.